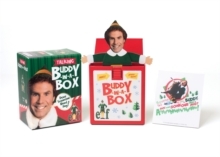 Elf Talking Buddy-in-a-Box : "Does somebody need a hug?" Elf , the 2003 film starring Will Ferrell as Buddy the Elf, has become the new family classic to watch over the holidays. This unique kit featuring Ferrell as Buddy (including his voice! ), makes a perfect stocking stuffer gift. Commemorating the memorable scene when Buddy tries to befriend a hostile raccoon, when Buddy pops out of the box he says the famous line, Does someone need a hug?" The kit also includes a colourful magnet featuring Buddy and the raccoon.